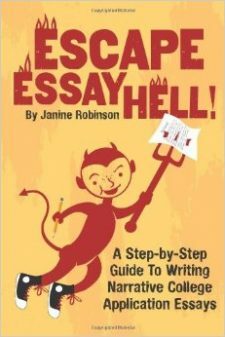 Either buy or check out some of the essay-writing guide books (Buy them used on Amazon for cheap!). Find the sections that feature sample essays. Read through the essay titles and skim essays that look interesting or might relate to a topic your student would pick. If you find one or a couple that you liked reading, and think your student might find them inspiring—either for how it is written, or how the introduction is a “grabber,” or the topic is relevant—put a post-it to mark the page. When the time is right, offer the book and suggest your student read the ones your flagged. Resist the urge to lecture them. Just set it on their desk and leave the room. If nothing else, it might get them started, and they will find their own favorite essays, and even read some of the general advice and tips in the book as well. All on their own terms. Remember, these essay assignments can be so daunting to students. They are told that 500 words can be admissions deal-breakers, and are their one chance to set themselves apart from the pack. That’s a lot of pressure on one little piece of writing! Also, many students have never written this type of essay—using the first person and being asked to reveal something about themselves. I believe the best guide and inspiration can be a good example or two. Suddenly, the student might realize that they also have a good story to tell, or that they can write something like that. The abstract task feels more manageable, and they are free to move forward. Also, if you hope to be tapped to help them further along in the process, it’s a good idea to read these books to educate yourself on how to write these essays. If you get the honor of being allowed to read a rough draft, or answer a specific question, or proof their final copy, you will be better prepared to direct them in the right way. I’m a writer, and they helped me immensely!